Some of the festival crowd listening to the Playing for Change Band. 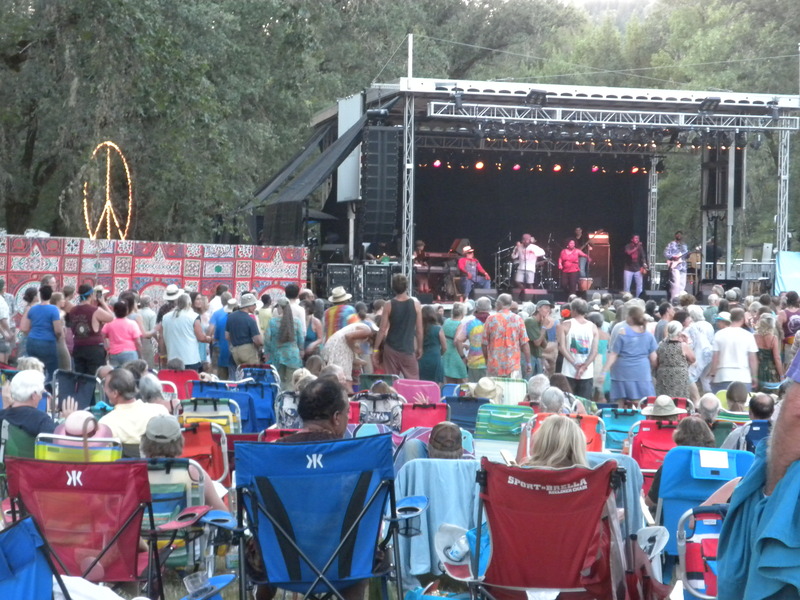 We spent four days last week at California’s Kate Wolf Music Festival, where both the music and the weather were hot. We arrived on Thursday to a huge southbound traffic jam on Highway 101. When we finally reached the festival gates, we were waved on and had to find a spot in the even longer traffic jam heading north. This was the first year the festival opened on Thursday so there were some glitches. Apparently a California Highway Patrolman decided that the festival could not open until the traffic jam cleared, even though the best way to clear the jam was to get people off the highway and into the festival. Broderick Crawford would not have approved. 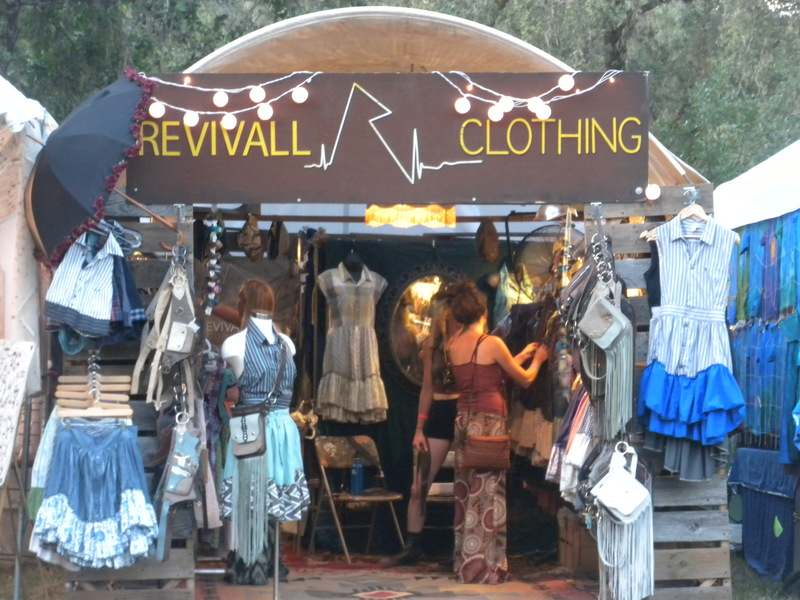 Along with music, the festival offers plenty of shopping opportunities. Once we were inside, we got our wristbands, set up camp, and checked out the scene. This was our second festival, so we are veterans now. The main stage was not in use on Thursday, but the three smaller stages all had performances, so there was plenty to see. We caught a Kate Wolf song set by the California group Poor Man’s Whiskey; a favorite group from last year’s festival, the Bootleg Honeys; and a group that was new us, the T Sisters, and then made it a relatively early night. Friday offered a second straight day of 100-degree temperatures, but we finally scored a place in the shade and got to enjoy the music. We started off with Hot Buttered Rum, another of the many fine California bands at the festival. The main-stage acts were mostly new to us. Roy Rogers and the Delta Rhythm Kings should not be confused with Roy Rogers and the Sons of the Pioneers. Rogers, who is named after the original Roy, is a terrific slide guitarist who was joined by Carlos Reyes, who plays the fiddle and the 36-string Paraguayan harp. Charlie Musselwhite, a master of the blues harmonica, and Lukas Nelson, son of Willie, and his band Promise of the Real. Lukas, who calls his music “cowboy hippie surf rock,” doesn’t sound much like Willie. Most people wear shorts and T-shirts, but some like to dress up. One act we had seen before was the Playing for Change Band, which is made up of street musicians from around the world. The final act was Angelique Kidjo, an African singer who was a dynamo on the stage. At one point she went out into the audience and at the end she invited people up on stage to dance with her. It was quite a performance. Friday was the day that the Supreme Court handed down its gay-marriage decision, which was noted several times throughout the festival. Each time it got a roar of approval from the audience. One had the sense that the festival attracts few Republicans and even fewer members of the Tea Party. Saturday brought slightly cooler weather and a much more familiar line-up, including the folk icons Judy Collins and Holly Near; Maria Muldauer, who had a lot more to offer than “Midnight at the Oasis”; and the Wailin’ Jennys, a female trio who offer incredible harmonies who we have seen before. The final act was Smokey Robinson, who still puts on a great show at age 75. 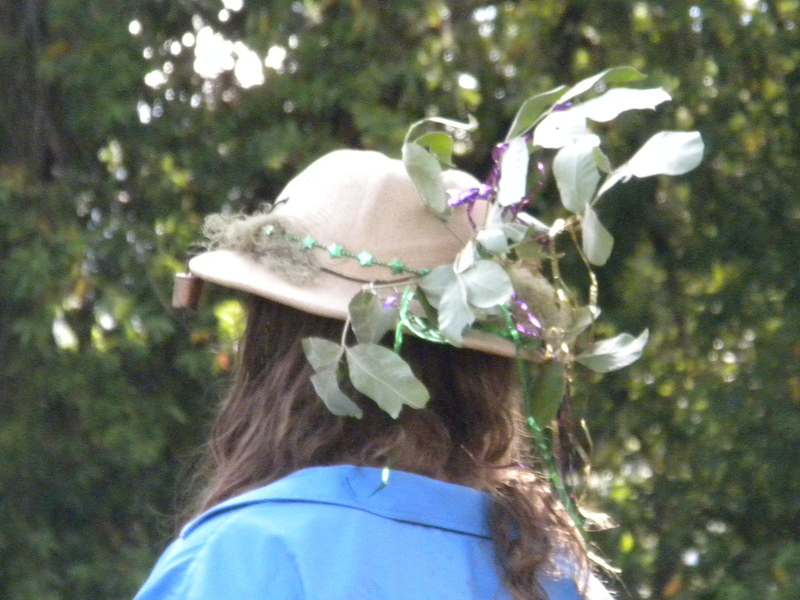 Just some of the unusual headgear that could be seen. Perhaps because this was the 20th festival, Kate Wolf’s music was more prominent than last year. There were three Kate Wolf song sets and a session where several people reminisced about the singer, who died of leukemia in 1986. The last of these sets kicked off Sunday’s session and included a Hawaiian singer named Keale who sang part of one song (“Pacheco”) in Hawaiian. That was followed by Dan Hicks and the Hot Licks, who performed even though he has liver cancer and has canceled the rest of his tour, and the Waifs, an Australian band we really liked. The penultimate act was Lisa Fischer and Grand Baton. She is a long-time back-up singer who has performed with the Rolling Stones, Sting, Nine Inch Nails, and many others and was in the documentary 20 Feet From Stardom. I was expecting a glitzy pop act like Smokey Robinson or last year’s Darlene Love, who was also in 20 Feet. Instead Ms. Fischer performed a series of ethereal melodies, including a version of “Jumpin’ Jack Flash” unlike you’ve ever heard it, all the while clad in a flowing, gravity-defying ensemble that captivated Robin. The festival was closed by Steve Earle and Dukes, who played material from his new blues album, “Terraplane,” as well as many older songs. He played “Copperhead Road,” his big hit, about halfway through the set “so those of you on probation can get home before your ankle bracelets go off.” It was a great finale. 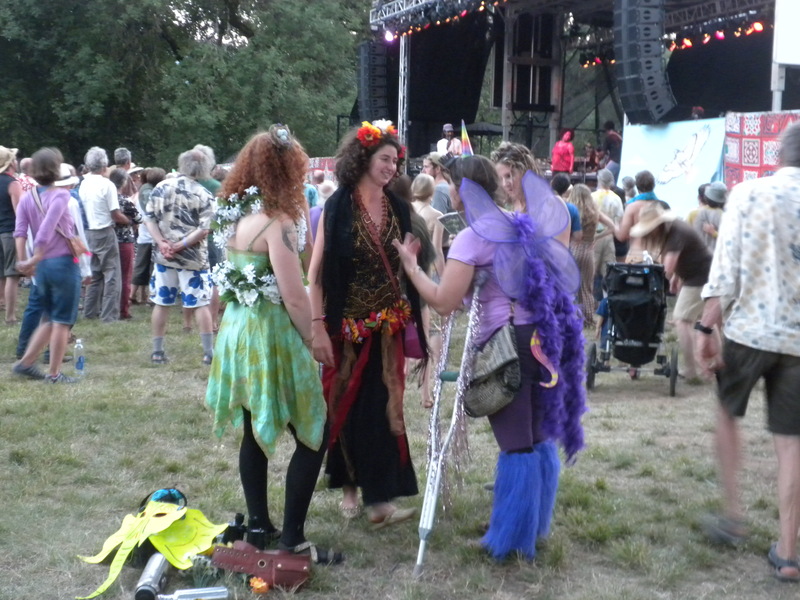 The festival offered its usual complement of characters and unusual attire. A guy who dresses in metallic shirts with flowing sleeves who was also at last year’s festival even drew a comment from Judy Collins. And of course there was more music than two people could hear. The festival offered 34 acts, of which we saw 23 if you count joint appearances. We had a great time but are glad to back on the island, where people complain about the heat when the temperature hits 85. I think we’ll stay here for a while. Wow, I live right here and have never been to the Kate Wolf, always a bit to expensive and too much time to take from my schedule. I’ve always wanted to go, I’m very glad that you got to. It is a very special thing.